An Ideal Teacher Essay. Welcome to our website. This is the one of the best and an unlimited the source of Essay and Paragraph. 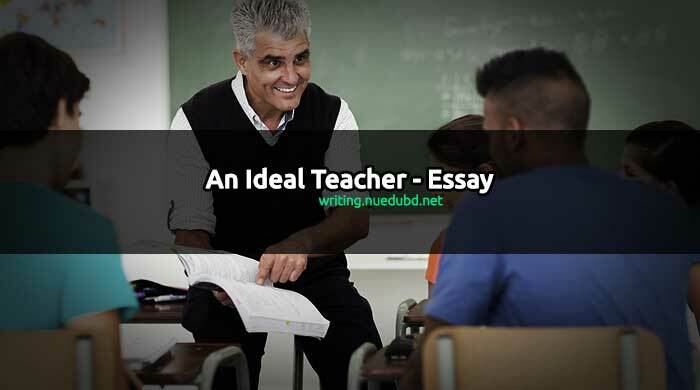 Now NU EDU BD writing section sharing the most useful An Ideal Teacher Short Essay for you. I hope you'll like it. Education is one of our basic rights. This is a very short and easy essay for you. Now check this out the Short composition on An Ideal Teacher. Introduction: The teacher who teaches the students in an easy manner and possesses some special qualities in an ideal teacher. He is an asset to the nation. He contributes n lot for the country. He plays for the nation building. The students respect and love him much. Qualities of an ideal teacher: An ideal teacher possesses some outstanding qualities. These qualities make him dear to his students. He has to cultivate these for his overall praise. These qualities help him to reach the perfection of the teaching profession. The qualities of an ideal teacher are given below. An easy method of teaching: An ideal teacher has an easy method of teaching. He will teach the students so easily that no student can read the lesson at home. He will make the lesson enjoyable and charming. His students will understand the lessons. He has to make the lesson simple. If any dull or weak student fails to understand, he will discuss the lesson until they are understood. Because of his easy and simple manner of teaching., an ideal teacher will be successful in imparting lessons to the students. Knowledge of the subject: An ideal teacher must have proper knowledge of the subject. He will be clear in expressing an idea in the classroom. He will not go to class with shallow or light knowledge. His sound knowledge on the subject will help the student understand the difficult subjects. Regular and dutiful in classes: An ideal teacher must be regular in classes. He will not be late. He will make preparations to attend classes on time. He will be dutiful in classes. He will not neglect his duty. He will complete his courses in time. He will give suggestions, make questions and help the students to answer these clearly and excellently. He will examine the answer scripts. He will give home task and extract the response of the students. Easy, soft and clear voice: A good teacher will possess an easy, soft and clear voice. His gesture and posture should be like those of an actor. He will be distinct to the students, His voice will be enjoyable to all. If he is not clear in voice, his students will not be able to understand his class lectures. Thus a good teacher must possess a soft and clear voice. Preparation of classes: An ideal teacher will take preparation for classes. He will make a lesson plan and a chart. This will help him to impart knowledge in a logical and harmonious way. In fact, the lesson plan is a tool at the hands of an ideal teacher to make his lessons enjoyable to the young learners. Friendship with the students: An ideal teacher will maintain a good relationship with his students, He will be their friend, philosopher, and guide. He will not be rude to the students. His rough and harsh behavior may beget the students’ ill-feelings. His cordiality and affection will easily attract the students. The student-teacher relationship is the vital relation. An ideal teacher will have this relation. This relation will lead him to extract the debilities and weakness of the students. Finding these, he will Endeavour to develop the students. Man of principle: A good teacher has some cardinal principles. He will be truthful, bold, courageous and honest. He will speak the truth. He will be fresh, free and fair in his dealings, He will be religious and just. He has a sound character. His students will be motivated by his moral principles. These will lead the students to the path of success in life. In fact, the good principles of an ideal teacher will be the motto of his students. Conclusion: An ideal teacher plays a vital role for the students. He will find out the hidden talent o the students. He will Endeavour to flourish the merits of the students. He has the highest responsibility of building the nation. He must try to discharge his duty perfectly. If he can easily do these, the nation will owe to him permanently.